GORGEOUS! Bling! Bling! Just when you thought there was nothing left to be "bling-ed"... something e..
Fab FabuLeash - many color choices! Absolutely Fabulous! Every Posh Puppy Needs One! Like a little bling in your life? Want to share wi.. This funky mix of acrylic beads on a stainless steel cable may be just what your dog ordered to flau.. Your dog will be the ultimate fashion display as he or she struts down the street. This dog le..
We took our already Wild Animal Print Leashes and made them even more wild. 48 Inches Long. Ava..
Fabuleash Dog Leash and Collar Combo - The Formal Collection - comes in 3 colors! Gorgeous! Dress up your favorite furry companion for those occasions that call for more than just ..
FabuLeash™ - Crystallized Retractable Leash - available in 3 colors covered with bling! WOW......GORGEOUS! No matter how you say it; sparkling, dazzling, bling bling etc. These retracta..
FabuLeash™ - FabCetera - Pink Animal Print! For those that need just a little more attention! The Pink Animal Print Fabuleash simply needs to.. SO CUTE! Bling! Bling! Just when you thought there was nothing left to be "blinged"...s.. ANIMAL PRINT! Bling! Bling! Just when you thought there was nothing left to be "blinged"...something..
Bling! Bling! Just when you thought there was nothing left to be "bling-ed"...somethin..
Swarovski Crystal Fashion Dog Leash - Pink with Paw! FANCY! Bling! Bling! 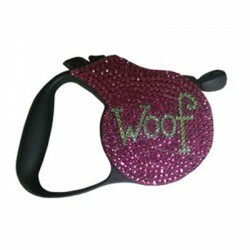 Just when you thought there was nothing left to be "blinged"...som..
Swarovski Crystal Fashion Dog Leash - WOOF! WOOF!! Bling! Bling! Just when you thought there was nothing left to be "bling-ed"...something else ..
Bling! Bling! Just when you thought there was nothing left to be "bling-ed"...something..
ZEBRA FASHION!! Bling! Bling! Just when you thought there was nothing left to be "blinged&qu..